Is Bob Gatchel Legit or a Scam? HomeCareerInstitute.com is a new website from well known internet marketer Bob Gatchel that offers people training and eventual employment as an auction listing agent. An auction listing agent is someone who lists items on auction websites, like eBay, and attempts to sell those items for prices higher than was paid for them. The profits from the sale go to the auction listing agent. 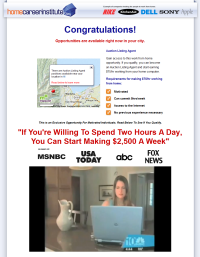 Is Home Job Listings Legit or a Scam? Home Job Listings is a job service where, in exchange for your contact information, you get free access to their job listing database. Home Job Listings advertises job opportunities in a variety of categories: telecommuting, hourly, part time, freelance, and online jobs. Most of the jobs they have listed are basic, entry level positions from national companies whose positions are also listed on their websites. TekCollect.com Reviews – Legit or Scam? Tek Collect is a collections agency that employs at home workers to collect debts, rather than establishing a brick and mortar call center. This is a common type of telecommuting position, as any job that needs only a phone and a computer to complete the work is easy to do from home. Tek Collect appears to be a third party collection agency, which means that they enter into contracts with companies to collect their debt for them for a fee. This is a list of resources for finding real work at home jobs. Although I’ve done my best to make sure all of these companies are legitimate and hiring, things change and I can’t keep up with all the websites listed here. So please use your best judgment when applying for any online job. What Kind of Companies Hire at Home Employees?